Two eBooks Full of Easy Recipes That Will Keep You Satisfied As You Slim Down! Looking for a bit of inspiration to get to your healthy, optimum weight? These two books are near and dear to my heart, since they tell the story of my struggle with weight and how eating real, whole foods in reasonable portions finally got me off the ‘diet’ trap. The delicious recipes included in these ebooks aren’t diet food – they’re simple, yet from scratch recipes you and your whole family will love! After struggling with weight – gaining, losing, dieting, and yo-yoing through my teens, 20s and 30s – you’ll see how I was finally able to not only reach my goal weight, but actually drop below previous “set points” to reach a healthy, easy-to-maintain weight. And all by eating real food, including butter, bacon, cheese, whole milk, roasted vegetables, and even dark chocolate. It’s true – and I want you to be able to reach your healthiest weight, too, which is why I compiled my weight-loss story and tips along with some of our favorite recipes (all part of our real-life menus) into these two eBooks. Easy to read and using everyday foods, you can implement the tips and start making the recipes right away. All but three of the recipes have appeared here on An Oregon Cottage, so they’ve been tested by readers as well as family and friends – these are not some created-in-a-lab-kitchen recipes that you’re not sure are going to work. For only $2.99 each (or buy them together for just $4.99 for both!) 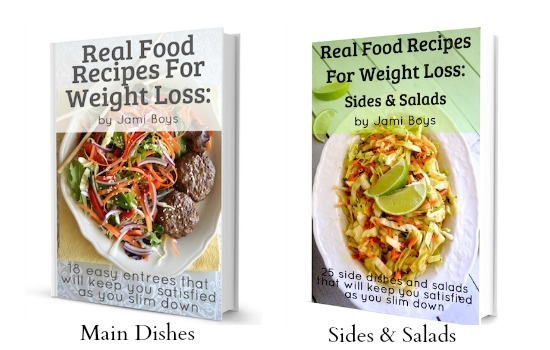 these books give you my story, tips, weight loss details, and the recipes to support real food eating in easy-to-read ebook formats. Have You Wanted To Lose Weight But Been Frustrated With Dieting Like I Was? 18 main dish recipes and 25 side dishes and salads that are simple, from scratch & satisfying. How eating real foods & using portion control can help you lose more weight than ever before. Tried-and-true tips & techniques to help you succeed with your weight loss. Recipe categories include main dishes with Chicken & Turkey, Beef & Pork, Seafood, Slow Cooker and more, and sides and salads for every season. You can download “Real Food Recipes For Weight Loss” right now and get started making these dishes tonight! Thanks so much for taking the time to check out our ebooks! If you’re a reader of AOC, commenter, follower or buyer of our books, I appreciate you – you’re the whole reason I write this blog and try to provide something of value to you. You make this blogging adventure worth it, and I’m grateful!